As soon as Halloween is over and done with, thoughts very quickly turn to Bonfire Night and the very real desire to set fire to anything and everything. The temptation right now for Leeds United fans is to burn everything they own that even vaguely reminds them of football, such is the rapid descent in form that is currently being experienced. There is a strange sense of satisfaction in watching something crackle and burn and disappear into the air, unless it’s Leeds United’s promotion hopes for yet another season, and that’s the vivid prospect we are watching unfold before our very eyes. 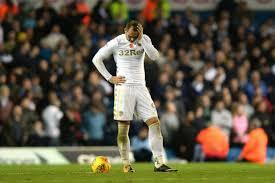 October ended with a shattering late defeat to Derby County, and Elland Road emptied rapidly in a foggy murmur of discontent. It was a night that started so promisingly with an early goal and a sixty minute performance that belied the lack of confidence that had engulfed the team in recent games. But in familiar fashion, and in fairness as a result of some dubious refereeing decisions, it all came crashing down, and somehow we trudged home on the wrong end of a 2-1 scoreline and thank God there were no more trick or treaters knocking on the door because patience had well and truly worn thin. Six defeats out of eight games tell its own story, and if it wasn’t for the extremely welcome 3-0 win at Bristol City last month, then the calls for Thomas Christiansen’s head would be gathering a lot more pace. It is clear that whatever propelled Leeds to an unbeaten opening seven games to the season has long since disappeared, the key now is whether the management at Elland Road can work out what it was, and more importantly, rediscover it. There can be no doubt that Christiansen needs some help now, and the nagging feeling is that there is a lack of nous and experience of this division, on the pitch, in the dugout and in the backroom staff. Christiansen announced himself with assurance and dignity in the early stages, his footballing principles were there for all to see and his ethos gathered some quick momentum. Now it is evident that he needs to learn very quickly how to adapt that for different games. It is almost like his team’s development has missed out two key stages; he has the flair and the pretty passing, but he has missed out the mental strength and the character. Every team in the Championship needs that, you need to battle and earn the right to play football first and foremost, and sadly it appears that Leeds United lack that at this moment. We need leaders, people to organise a team when the pressure is on, people to be vocal and get players’ heads up when things are going wrong. Right now, if Leeds United concede you know what is going to happen next, and Christiansen needs to learn how to affect games better and make sure his players can have an influence. Of course we need to remember that this is a new team, with new management and a new footballing ethos. There is new structure at the club and a completely new outlook. Things like that take time to operate exactly how you want them to. In many ways it was a miracle that the season started as it did, and certainly we were lulled into a false sense of security, but it also shows that perhaps we are not too far away. Games are only being lost by fine margins, and in time, knowing how to manage games, how to change formation to make a difference and knowing who to rely on when, will become easier. The key is whether Christiansen will get that time. For me, I think it is imperative that we continue to break the mould at Leeds United. I say ‘continue’ because already we have seen a raft of positive measures implemented by the club, which add up to a ship clearly sailing in the right direction. The club is progressing, it has its eyes open and has a vivid sense of what is needed and how those things can be achieved. We are not used to seeing that, rather a blurred vision of lawless and rudderless chaos. Change and instability has done us no good. Breaking the mould would be to stick with the courage of our convictions and believe that the people in certain positions will learn and grow as the club grows, and along the way they will improve. Given the right tools of course, and perhaps if Andrea Radrizzani and Victor Orta have learnt anything from the past month, it’s that the January transfer window is something they need to take an active interest in, with opportunities to ship players out as well as in. So we come to November and the run up to Christmas. At the Old Peacock we have enjoyed some big days and nights in October, particularly the Friday night of the Sheffield United game, where we felt the occasion warranted a live performance from The Snapp – usually just reserved for Saturday games – and a big attendance brought a very special atmosphere to the pub and the beer garden. November on the other hand offers just one home game, and thanks to Sky TV that comes on a Sunday lunchtime, when Middlesbrough visit on November 19th. However, we will be sure to expect a healthy attendance again for the return of Garry Monk and our doors will be wide open for everyone to enjoy a Sunday afternoon drink prior to the game and afterwards. Talk of Christmas brings us to our regular festive menus at the Old Peacock. We have our Christmas Fayre Menu (two courses for £13.50 or three courses for £15.50) which is perfect for those office parties and for friends and families planning a special Christmas get together. This starts in December and runs all the way up to the big day. On Christmas Day itself we have a special menu (four courses for £49.95 per person, or £14.95 for under 12s) but this traditionally sells out quickly, so please contact us on 0113 2715962 or call in personally to secure your place. We also want to bring your attention to the Ossett Brewery Open Day, which takes place at the Kings Yard brewery in Ossett on Saturday November 18th, from 12 noon until 7.00pm. There will be live bands, bouncy castles, BBQ food and of course lots of beer and the chance to view the new extensions to the brewery. So all in all, there is plenty going on and plenty of work to do. It never stops at this time of year, but we get through it and we are confident that Leeds United will too. Like the Old Peacock, it is an organisation that survives through teamwork, hard work and staying strong when the chips are down. Now is the time to keep together, keep cool and keep on doing the right things, and eventually things will turn around.